I had a chance to visit the University of Miami, FL campus yesterday and it brought back a lot of memories including the self-directed study program I was involved with and my internships with the Miami Marlins (Minor league affiliate) and Baltimore Orioles. Before the Pursue the Pennant board version game was even published (which later became DYNASTY League Baseball) and was still in the design phase, I had the chance to play test it with a few friends, but also with a few Major League Baseball players. Dennis Martinez of the Baltmore Orioles was the first Major League Baseball player to test Pursue the Pennant and one of the things I most remember is how he would “pitch” with the dice. It was almost as if he was pitching curve balls with the dice! Dennis is among the most animated players I have played face to face and it is sheer joy playing him in face to face games because he is having so much fun playing. Dennis Martinez “ptiches” the dice! The Milwaukee Brewers Paul Molitor and I played Pursue the Pennant one of the club house rooms underneath Milwaukee County Stadium. So here I am playing with the most popular baseball player in Milwaukee other than Robin Yount and I am explaining how the three percentile dice are read (red, white and blue) and how to look up the play result on the player cards. I roll the dice in the first innning managing the Baltimore Orioles and of course Paul is managing the Brewers and is batting himself leadoff. The dice roll out of my hand and the red die comes up “1” and the white and blue die follow… As any DYNASTY League Baseball player knows, the 100’s are generally good numbers for hitters. Well, this number was more than good it was great. Paul looked up the dice roll number on the Paul Molitor player card he was holding and a smile came across his face. “HOME RUN! ” Paul laughed. I laughed. Leadoff HR for the future Hall of Famer. What are the odds? 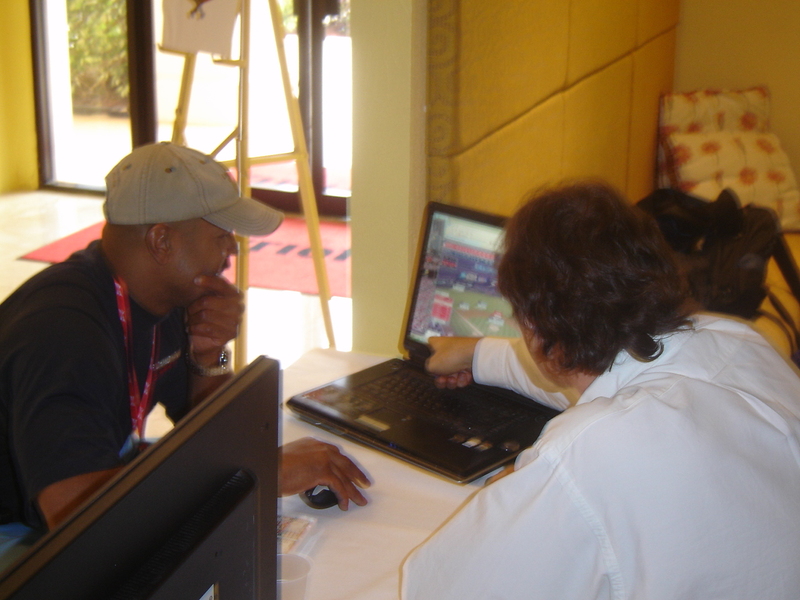 Atlanta Brave and St. Louis Cardinal Brian Jordan and I played the new DYNASTY League Baseball Online version together last January at the Cardianls Legends event and I think Brian’s enthusiasm for the game was contagious. I think he had more fun than I did which is hard to do! We don’t get the chance to play DYNASTY League Baseball vs. Major League Baseball players everyday, but we do have the chance to play vs. friends. If you have local friends it’s a great opportunity to play the DYNASTY League Baseball board version with them and share some great times together for a series or in tournament or league. 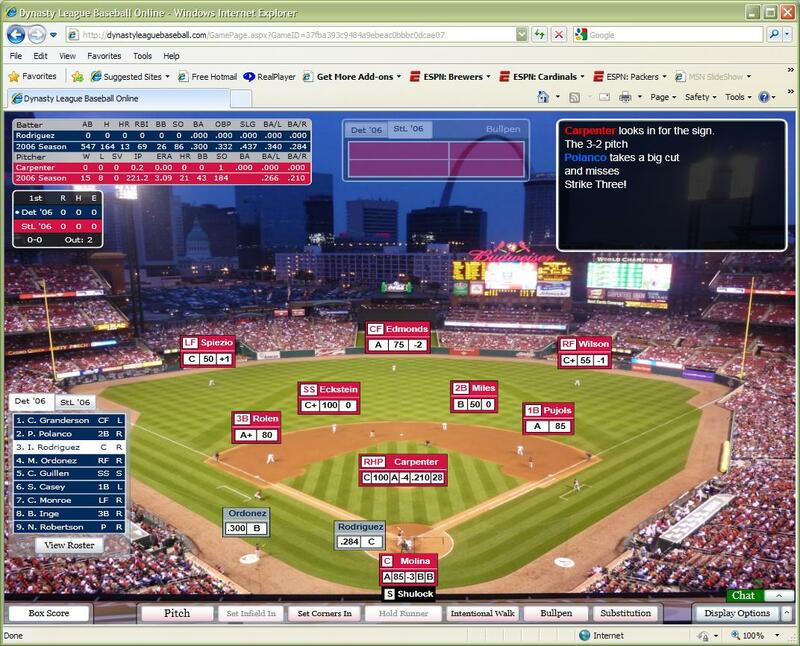 If many of your friends or family are not close by, DYNASTY League Baseball Online “Series” allow you to play a long distance game online with a friend in one click. Prior to playing just invite him as a friend on DYNASTY League Baseball Online and when he is logged into DYNASTY League Baseball Online the same time as you are you can create a “Series” and invite him to play. It is easy and it is so much fun. Don’t have a friend to play with when you feel like playing a game of DYNASTY League Baseball Online? That is why DYNASTY League Baseball Online is a multi-player game with solitaire options. You can play any team from any season in the DYNASTY League Baseball library vs. the new computer manager. I personally enjoy playing vs. both friends and solitaire and find most DYNASTY League Baseball players feel the same way. There are some people who only like to play solitaire. Other people only like to play vs. other people. What is true now though is that there has never been an opportunity in the history of baseball simulations to play vs. friends and other people like there is now with the advent of DYNASTY League Baseball Online and the community that plays there. With the daily online Greatest Team bracket tournaments there are always opponents to play vs. The Greatest Team leagues allow you to join a league and invite your friends into the same league you are joining as will the upcoming current season continuous “keeper” draft leagues. Jamie Hall and Mike Cieslinski playing a friends “Series” with their favorite Tigers and Cardinals. Yes, solitaire play is a lot of fun with DYNASTY League Baseball, but now you have a chance to play with friends old and new in DYNASTY League Baseball Online. How do I follow stats game to game to replay a season vs. the computer manager. What’s new in the recently released 6th Edition Game charts?